The Naval Postgraduate School (NPS) is located on the Pacific Ocean in Monterey, California, 120 miles south of San Francisco. The NPS campus covers 627 acres of land in Monterey County that have been the home of the school since 1947. NPS houses state-of-the-art laboratories, numerous academic buildings, an excellent library, government housing, and impressive recreational facilities. Monterey's rich history, the saga of California's Mission Trail, historic Fisherman's Wharf and Cannery Row, 17 world-class golf courses, the world's best aquarium, a unique variety of shops and galleries, and a spectacular assortment of parks and natural areas all combine to provide a truly spectacular place to live and work. The Monterey Peninsula has been called the greatest meeting of land, sea, and sky and is recognized as an ideal vacation and business destination. The Naval Postgraduate School's combination of operationally experienced students and defense-oriented faculty provide a quality setting to conduct interdisciplinary research on complex issues related to national and homeland defense. As such, many of the research and academic programs at NPS relate to the operational level of war. Major Commands include the Naval Postgraduate School, Center of Cryptology Detachment, Fleet Numerical Meteorology and Oceanography Center, Defense Language Institute/Presidio of Monterey, Naval Research Laboratory, and Naval Medical Administration Unit. Monterey is serviced by three major airlines with most flights connecting through either San Francisco, Los Angeles or Salt Lake City. Persons taking a taxi should direct the driver to take them to the Main Gate at NPS. Nearly 1,500 students attend the NPS. The student body consists of officers from the five U.S. uniformed services, officers from approximately 30 other countries and a small number of civilian employees. Selection of officers for fully funded graduate education is based upon outstanding professional performance as an officer, promotion potential, and a strong academic background. The faculty, the majority of which are civilians, is drawn from a broad and diverse background of educational institutions and represents a prestigious group of scholars. Every class is taught directly by a faculty member, over 99% of whom have a Ph.D.
Major Commands at the NPS include Naval Postgraduate School (NPS), Center of Cryptology Detachment (CCD), Fleet Numerical Meteorology and Oceanography Center (FNMOC), Defense Language Institute/Presidio of Monterey (DLI/POM), Naval Research Laboratory (NRL), Naval Medical Administration Unit (NMAU). Reservations can be made at 831-656-2060/DSN 312-756-2060 or 831-656-2069/DSN 312-756-2069. The maximum length of stay is 30 days. Pets are now allowed. You can reach the Navy Lodge at 800-628-9466, 831 372-6133, FAX 831-372-6307 or online . The room costs $73.00 per night. Pets 50 pounds and under are allowed and cost $50 for a stay lasting 1-6 nights, $100 for a stay 7-30 nights. The Navy Lodge is within walking to the Housing Welcome Center, La Mesa Elementary School, NEX Mini-Mart, Family Service Center Short drive to Fisherman's Wharf, Cannery Row, Monterey Bay Aquarium, Naval Postgraduate School, Navy Exchange, and Gymnasium. Check-in 3:00 - 6:00 pm, check-out 12:00 pm. Accommodations: 72 units with private baths. Family accommodations. This is a Nonsmoking facility. If CBQ or Navy Lodge is unavailable, it is recommended that the student (and their family) and staff be prepared to stay in a hotel for the first week or so while checking out the housing situation (average cost $60-$100 per night per room depending on location and season). Reservations can be made with Resort to Me at 800-757-5646 or 831-646-9250. This is an agency that will locate accommodations to fit your needs; all that is needed is to call, tell them how many people, preferred area, and preferred price range. Another possibility is Sun Bay (located on what used to be Ft Ord - about 6 miles from NPS) at 800-285-3131 or 831394-2515 - they have furnished apartments that they rent weekly or monthly. At this time there is not a waiting list for government housing at the Naval Postgraduate School. To secure housing the service member must supply their local office with a completed application, DEERS information, and orders to Monterey. Military members assigned to the Monterey Peninsula live in military housing in the Ord Military Community. Service members are required to sign an agreement with Pinnacle Management, the contractor responsible for operating Monterey Bay Military Housing (MBMH). If you need additional information call the Housing Welcome Center (Clark Pinnacle), 1301 Leahy Rd., Monterey, CA 93940, 831-644 0400 or Fleet Family Support Center at 831-656-3060, DSN 312-756-3060.
International students who receive pay equivalent to US BAH should refer to their equivalent rank band area for housing information. If the resident is part of the FMS program, there are select homes available within older La Mesa Housing. Once this area is full, the family can choose to live in Marshall Park at the FMS rate. The FMS student can also choose to take a new home by paying full US BAH equivalency. The Primary Office ​is La Mesa Village at 866-902-6613. Marshall Park is available for all rank bands from E5 - O6 at the flat rate rents. The Primary Office is Marshall Park at 866-598-2655. Presidio of Monterey and Naval Post Graduate Historical Housing has 41 homes are reserved for Key and Essential residents as identified by command. The Primary Office is La Mesa Village at 866-902-6613. There is an enlisted single sailor dormitory located at the Naval Postgraduate School. Single sailors E-4 and below are given priority to reside in the dormitory, but can, with command approval, reside off the installation. E-5 and above single sailors can elect to reside off the installation. Enlisted geographically separated bachelors can reside in the dormitory, but single enlisted sailors are given priority. The cost of off-installation housing is high because Monterey is a resort/high cost of living area. The average monthly rental cost for a 1 bedroom, 1 bath studio apartment is $950. Average utilities cost are $200 per month. Many apartments require that you sign a one-year lease and are unfurnished. There is current availability for all unaccompanied service members. E1 - E4 can choose to live alone in Lower Stilwell in a 2 bedroom at BAH or can choose a 3 bedroom at the flat rate rent. If no two bedrooms are available, they will upgrade a Service member to a larger size pending availability. E5 - E9 can choose to live alone in Marshall Park at BAH or the flat rate, whichever is lower. O1 - O6 can choose to live in La Mesa Cliffs or Pineview townhomes at BAH or flat rate, whichever is lower. They allow Service members to choose to live together at the flat rate rents. The public schools are in Monterey County, in La Mesa (located less than 2 miles from the Naval Postgraduate School), and on Ord Military Community are run by the Monterey Peninsula Unified School District. The School year runs from early August through early June with three recesses (October, December, and March). The school district has 12 elementary schools, 4 middle schools, and 4 high schools. There are no DoDDs schools on base. There is a charge for bus service based on income and/or family size. The Monterey Peninsula Unified School District (MPUSD) Special Services requests that incoming military families with special needs children ages 3 years to high school contact the office and fax or mail the child's current Individual Education Plan and/or other pertinent information. For more information contact 831-392-3827. 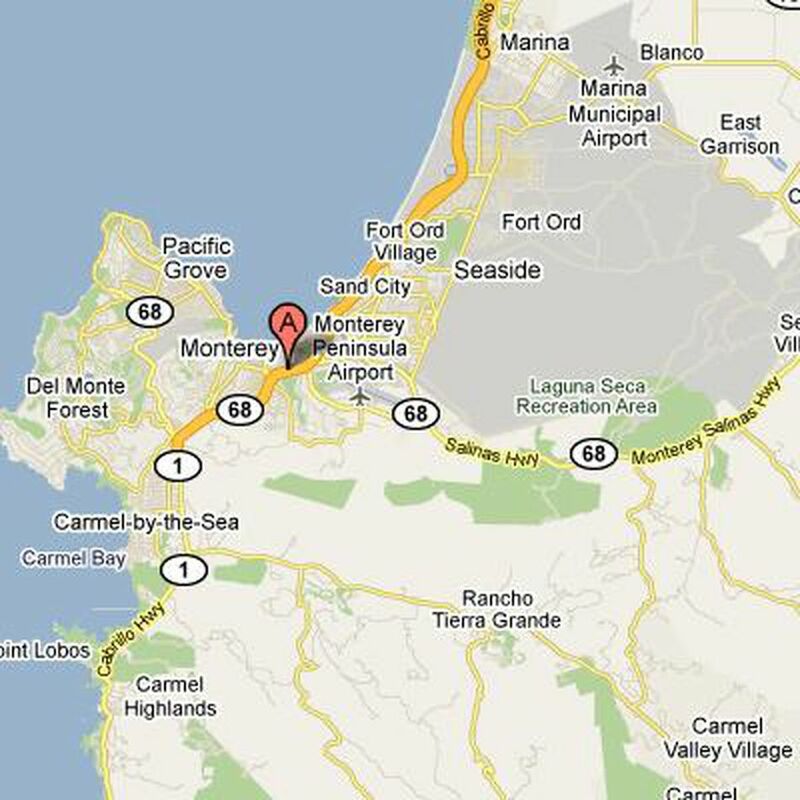 The Monterey Home Charter School (MCHCS) is a K-12 public school of choice that enrolls students in Monterey County and any adjacent counties. MCHCS works in partnership with the parents of students to help them design an academic program that follows California State Standards and Guidelines. After enrolling in the MCHCS program, families are assigned a resource teacher who will work with them on a weekly basis. The resource teacher assists families in the design, implementation, and maintenance of a personalized educational program. The parent then accepts the responsibility of being the primary deliverer of their child's educational program. Families that are interested in the MCHCS program must first attend a weekly informational meeting. Here, they will learn more specific details about the MCHCS program. At the meeting, parents can fill out a "Request for Participation" form. Families that complete the enrollment process are then assigned a resource teacher and are formally admitted into the MCHCS program. For more information please call 831-755-0331; FAX 831-755-0837. There are many private schools options in the area. There is limited or no adult education on the installation. The Monterey Peninsula Unified School District offers day and evening classes providing an avenue for adults to earn a high school diploma or a General Education Development certificate. Courses offered include parenting education, citizenship classes, computer lab, English as a Second Language, Alzheimer, and classes tailored for older adults. The Naval Postgraduate School Child & Youth Programs provide services for children 6 weeks to 17 years of age in state of the art facilities that are designed to accommodate the appropriate age group. Facilities are within walking distance from homes in La Mesa Village. The La Mesa Elementary School is right next door to the Child Development Center and up the street from the Tech Connection. The Child Development Center is geared for children 6 weeks - 6 years of age (Kindergarten). They offer full-time care, drop in care, life skills readiness preschool program and before & after kindergarten care. They are located across the street from the housing office. You may contact them at 831-656-2734. A "Request for Care" form for patrons wanting to be put on the waiting list for care is now on the Navy Website. You can go online and go to "Request for Care" and fill in the form. Programs offered through the Child Development Program include: Full Time Infant Program (6 weeks to 1 year old), Full Time Pre-Toddler Program (ages 1-2 years old), full Time Toddler Program (ages 2-3 years old), Full Time Preschool Program (ages 3-6 years old), Before & After School Kindergarten Program and Life Skills Readiness Program (Part Day Preschool Enrichment Program). The Consolidated Regional Wait List for all Navy child and youth programs (Child Development Centers, Child Development homes, School-age care, Youth programs) at the Naval Postgraduate School area is maintained by the Resource and Referral point of contact at 831-656-2734. COMNAVREGSW INSTRUCTION 1700.13b applies. Fees are in accordance with DoD regulations; all fees are based on total family income. Child Development Homes Child Development Homes are an alternative to center-based care for children 6 weeks through 12 years and are often preferred by families because of the small group sizes, the home-like atmosphere and the flexible hours of operation that other centers cannot accommodate. Child Development Homes assist parents by providing a warm, family setting in which children can participate in developmentally appropriate learning activities as well as home life experiences. The Navy certifies Child Development Homes in La Mesa Housing. For more information or to become certified to run your home Child Development Home, call 831-656-2734. The SAC program offers before and after school care for La Mesa Elementary students, ages 5 - 12 ( K-6th grade), weekdays 7:30 - 8:00 am and 2:00 - 6:00 pm. Day Camps are offered when school is not in session, weekdays 9:00 am-5:00 pm. You may contact the Youth Center at 831-656-2127 for more information on the SAC program. Quality health care is available to the military community through the Presidio of Monterey Army Health Clinic (831-242-5614/5, DSN 312-768-5614/5) and the three hospitals in the area. There is a Navy Medical Administrative Unit (NAMU) located within the Army Clinic. The Presidio of Monterey Army Health Clinic provides treatment for Active Duty Military personnel only. The TRICARE system provides medical care for Family members (1-800-242-6788 Coordinated Care Division - (831) 242-0304/08). You may contact Family Member Dental Plan (FMDP) at 1-800-337-9991 or Dependent Dental Plan (DDP)at 1-800-866-8499. The Branch Dental Clinic's telephone is (831) 656-2477 EMERGENCY BEEPER: 685-5323 or Quarter Deck (831) 656-244.